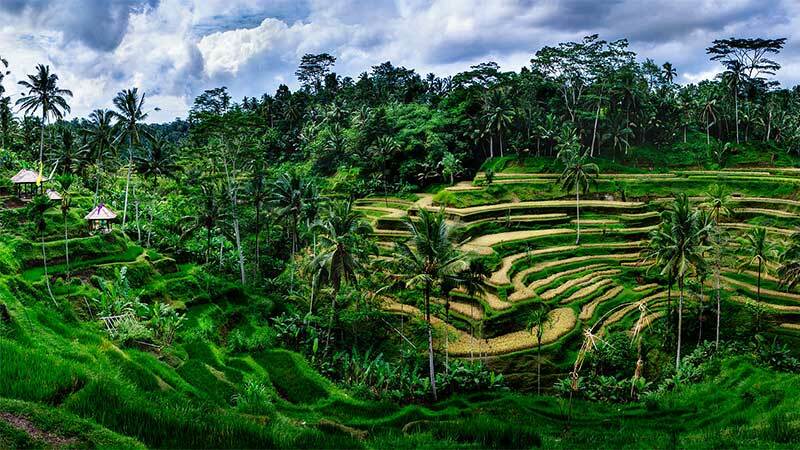 Ubud is a town in central Bali that is regarded as the cultural and spiritual centre of Bali. It is especially famous as an arts and crafts hub. Due to its elevation at 200 meters above sea level, Ubud enjoys cooler temperatures than the coast so just in case bring a long-sleeve shirt and long pants with you. And bear in mind that during the wet season, especially in January and February, it rains a lot. That said, there are some remarkable sights to be found and things to be done and the place has a general atmosphere of wellbeing. 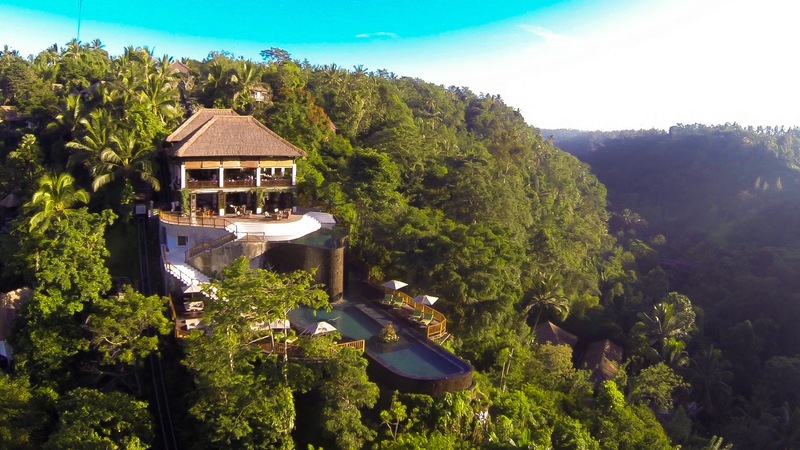 Hanging Gardens Ubud is a five-star luxury resort built on 32 hectares of land situated near Payangan, a village north of Ubud. It is surrounded by ancient trees, steep terraced gardens and jungle forest. It is a sanctuary inspired by nature that was built harmoniously into the landscape leaving as small a footprint as possible. Their world-famous and award-winning pool is a split-level infinity pool suspended over the dense rainforest. The price per night for a villa starts from around Rp. 4.700 000 but you could enjoy the view while skipping the accommodation costs by just going for cocktails at the resort’s bar. For a more budget-friendly alternative which also has an infinity pool with a view over the rainforest, I would recommend Beji Ubud Resort. The deluxe rooms start from about Rp.1.000 000++ per night. For a different kind of accommodation that also comes with a view of dense, evergreen rainforest choose Sang Giri, Bali’s first deluxe tent resort where you can experience camping the luxurious way. Price per night start from Rp.1.000 000. I recommend booking through a hotel booking website such as Agoda to get the best deal. Monkey forest on Monkey Forest Road is a must-see for everyone visiting Ubud though it probably won’t be the most memorable of your experiences. 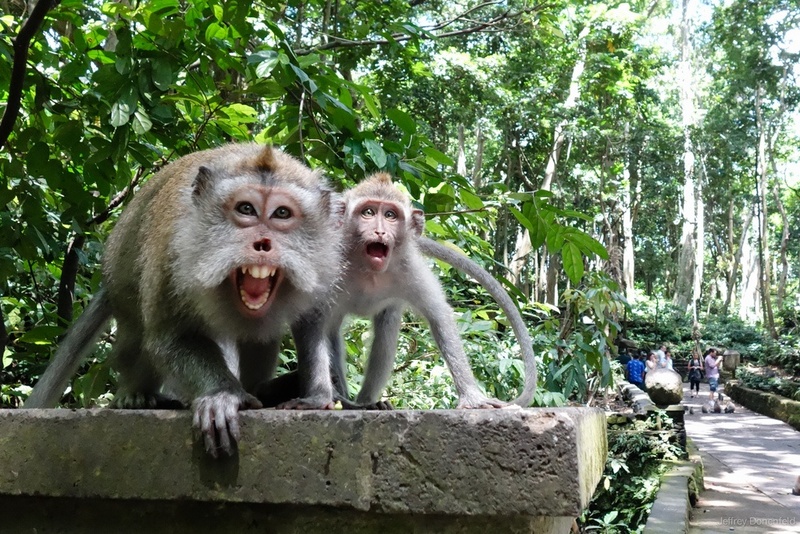 It is the home to a huge group of balinese long-tail macaques. They are not shy at all so you had better take good care of your belongings if you don’t want to see your food or sunglasses taken from your bag. As well as plenty of monkeys you will also find three temples within the forest that has a real jungle-feel to it. 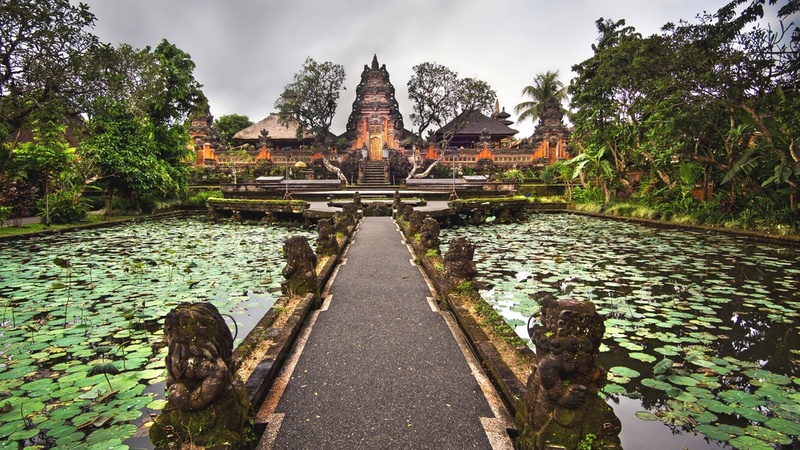 Pura Taman Saraswati is a picturesque temple located right in the heart of Ubud. It honors Saraswati, the goddess of knowledge, literature and art, and is set within a beautiful water garden with thousands of lotus flowers. Finding it might be a bit difficult because it’s located behind Starbucks and Lotus Cafe and not easily seen from the road but it’s definitely worth visiting and there is no entry fee during the day. Remember to cover up modestly and wear a sash or a sarong when entering the temple. Please don’t enter the temple with an open wound or while menstruating, and remember pay extra respect to the people attending the temple for religious purposes. Being the spiritual capital of Bali, Ubud is the perfect space to immerse yourself in the practise of yoga. 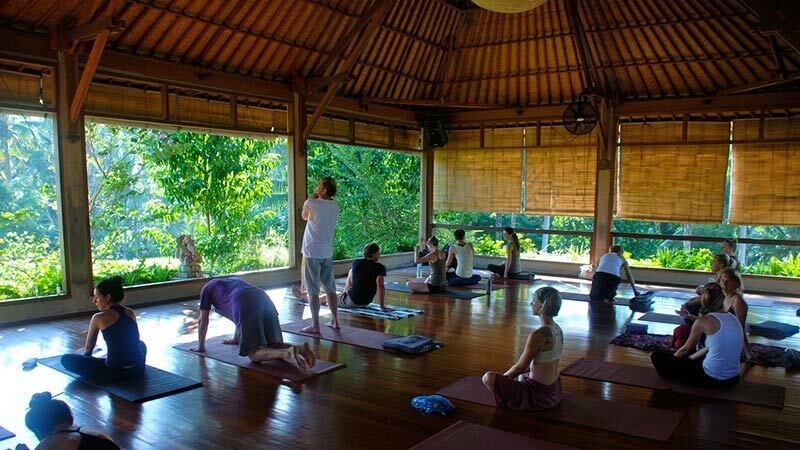 The Yoga Barn was created to bring together community and give back to the island of Bali. It is a full service yoga studio and holistic retreat centre. There are daily classes and workshops in various styles of yoga, meditation or for example ecstatic dance. There are also ayurvedic rejuvenation and cleansing&detox retreats on offer. The basic yoga classes cost Rp.130 000 for 90 mins. No matter where you stay in Ubud, lush green rice fields won’t be far away. One of the best ways to enjoy them is to venture out and find a small track leading to the countryside and see where it takes you. You might want to ask for some tips and directions from your accommodation. One of the most accessible walks is the Campuhan Ridge walk that runs along the valley of Campuhan River. The paved path will offer you views of the jungle that covers the river gorge below and takes you through rice fields and past villages. Another good option is a hike through Tegalalang rice fields known for their lush greenness. Biking is also a great way to explore the countryside. You can either rent a bike and with the help of a map take a tour of your own (just stick to the back roads as the traffic on the bigger ones can be really nerve-wracking) or join an organized tour. If you are looking for an adrenaline rush go white water-rafting at either the Ayung or Telaga Waja river. On either one you will be rafting for around 2 hours and between rapids can enjoy the scenery. The Ayung is the more popular and accessible one but Telaga Waja is more challenging. The best time for white-water rafting is the wet season between November and March when the rapids are at their wildest. The professionalism and safety standards of the companies offering this activity varies a lot so make sure to check some recommendations before you book your rafting trip. To assure great price and proper safety standards, book your trip here. Cooking classes are a great way to get a look into any culture. In Ubud these are held either within restaurants or in private homes. Most of the classes start with a visit to Ubud morning market or maybe an organic farm in the midst of rice fields. After an introduction to the classical balinese ingredients and cooking techniques you will get to cook numerous dishes like sate lilit, gado-gado and pisang goreng and finally, feast on them. Prices usually vary between Rp.350 000 and 500 000. Check out Rumah Desa, Casa Luna and Lobong. You could also take up a silversmithing class at Studio Perak. It is a half-day class either in the morning or afternoon where you get to make a silver pendant or ring of your own design in just three hours from start to finish while learning the basic skills of silversmithing. Price for the class is approximately Rp.350 000 including 5 grams of silver. You can expect to find plenty of museums and art galleries at the arts and crafts hub of Bali. The Agung Rai Museum of Art (the ARMA) is located just south of central Ubud. It is much more than just a museum as it also acts as a centre for cultural events, performances, art classes and workshops. There you will find contemporary art and originals, as well as reproductions from some of the Balinese masters and foreign artists who have influenced Balinese art. During your visit take also a stroll around the beautiful grounds where you might encounter performers practicing or craftsmen working. Entrance fee is around Rp.50 000 including drinks. Other places to visit are Museum Puri Lukisan and Setia Darma House of Masks and Puppets. 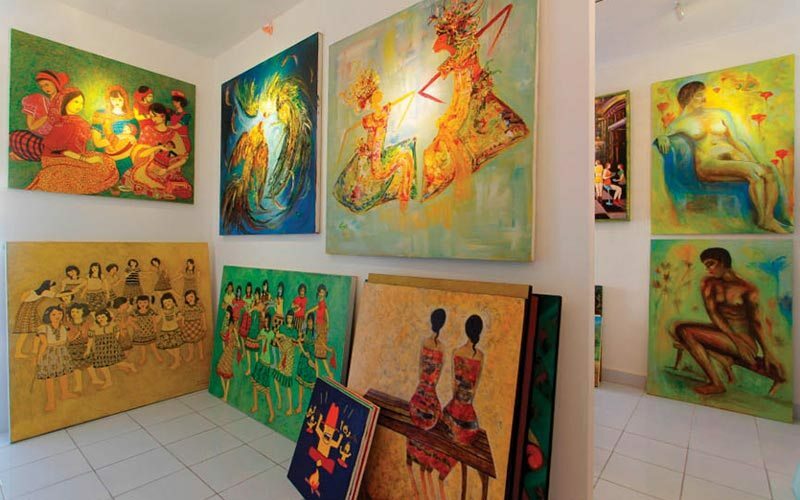 There are also many small galleries down the roads of Ubud, and many artists have own galleries next to their studios. If you’re looking forward to buying some art, these are your best option as they’re more apt to bargaining. Many of these sell similar paintings that have been copied numerous times so look around if you want to find something special. Ubud is truly a heaven for shoppers looking for local goods. All around town, especially on Monkey Forest Road and Jalan Hanoman, the small specialized boutiques sell everything from clothing and homeware to musical instruments and locally-produced organic foods. At the markets in and around Ubud farmers, artists and talented artisans sell their products. While many shops have price tags, bargaining is recommended especially at the markets and smaller local shops. 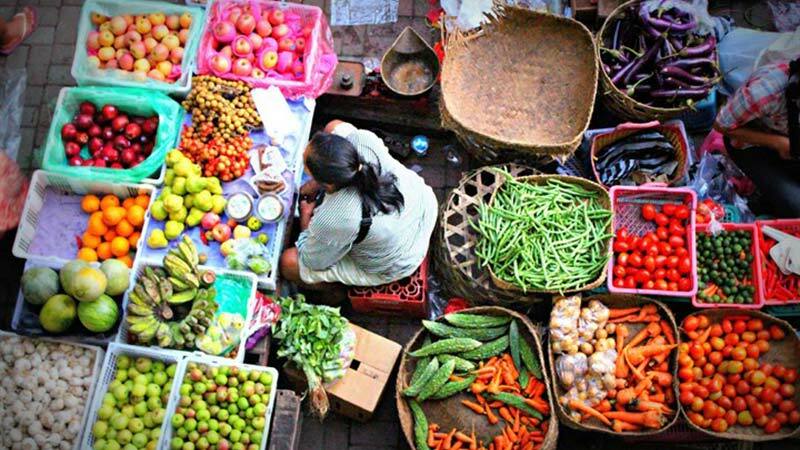 Visit the Ubud Organic Market on wednesdays or saturdays between 9am and 2pm for an array of foods. Please bring your own bag with you to help reduce the amount of plastic bags in Bali. I always seem to recommend balinese spa treatments in my blogs but that’s only because I simply adore everything on offer. So make sure you leave Ubud feeling relaxed and refreshed by indulging in some massages or other spa treatments. Ubud certainly doesn’t lack options so you can find something to suit every budget. You could loosen up tired muscles with a 1-hour balinese massage, try out some reflexology for your hands and feet or enjoy a full-day pampering session being massaged, scrubbed, bathed and cleansed. 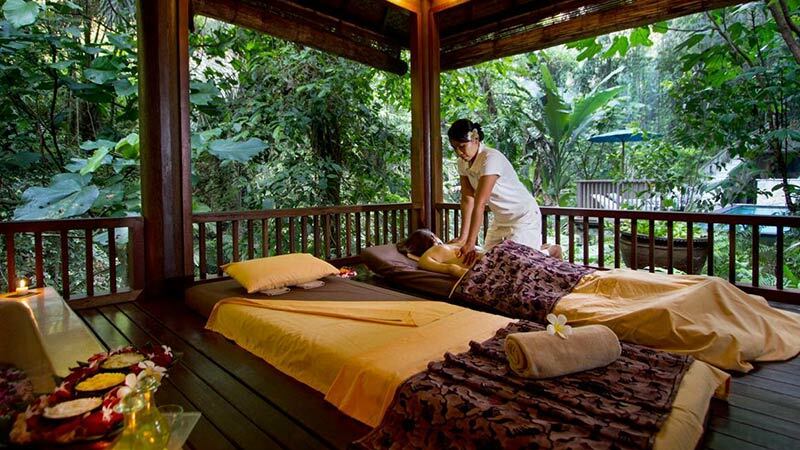 At high-end spas like Alila Spa expect to pay more than Rp.500 000++ for a 1-hour balinese massage. SANg Spa chain is good value for money; they charge Rp.185 000++ for a 1-hour balinese massage. Eve Spa is another good value chain; a 1-hour balinese massage costs Rp.155 000 and a 4-hour pampering session Rp.610 000. And they will pick you up anywhere in Ubud. For cheaper options look around for the small, non-fancy spas for 1-hour massages for Rp.100 000 or less.